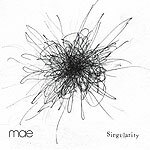 Gorgeous vocal harmonies, soaring melodic themes and a finely honed sense of dramatic tension make alt / emo rockers Mae sound more than a little like early '80s arena rockers on their new CD, "Singularity." In fact, time and again you can swear it sounds as if they're going to break out into a chorus or two from "Working for the Weekend." For good or better, that moment never happens on this album. Still, the 13 songs (including an uncredited last track that follows a John Cage-like 4:07 of silence) all have their decadent melodicism draped in in lush arrangements. More emo than alt, there is a subdued air that never quite gets shaken. Part of that make come from lead singer Dave Elkins' ultra-smooth singing style; sophisticated and polished, it's still hard to imagine him ever getting excited.